Cats live by their own set of rules and just when you think you may have slightly grasped what makes your kitty tick, everything will change. That ought to be one of the universal laws. Anyone who has shared a home with a feline for even the briefest of times will agree. Sugar is a 3 year old kitty who is challenged somewhat. She is deaf and always has been. She also has a very aloof personality and will rarely allow herself to be petted. That changes once we leave the house. She instantly dashes to the window and parades up and down the window sill inside. She brushes herself against the glass and even stands on two legs, stretching against the window, teasing and begging to be petted. Sabrina is a 5 year old kitty who does a great impression of the dog from 'Spanglish' (Check it out - Great movie!) Sabrina started to bring us one of her favourite toys and I'm not quite sure what inspired us to throw it, but we did, only to watch as she brought it back for us to do that again, and again, and again….. 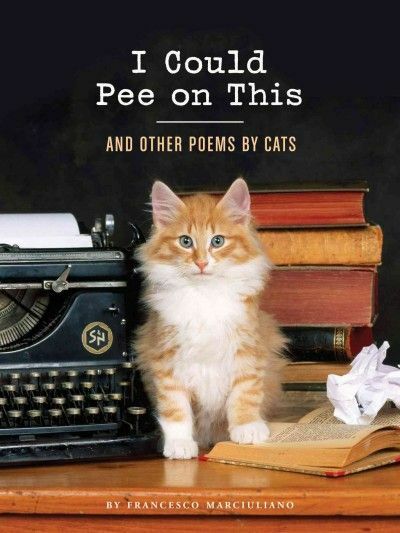 In I Could Pee on This and Other Poems by Cats we are treated to a number of cute, sometimes funny, almost always entertaining little poems. Each of these poems give us a glimpse into the mind of a cat and what they are really thinking when they bring you dead mice, curl up on the clean and folded laundry, or even reach up and pat you in the face repeatedly. More than a few of these poems resonated with me and I often found myself giggling maniacally but still found it difficult to raise it any higher than a 3/5 star rating (meaning I like it). Because the dog does tell me so. It’s a cute book and I’d recommend it as a gift for any cat-lover. It looks fun. I bet I could relate and laugh to quite a few, too. Life is never dull around cats. They certainly keep me on my toes.